In case of more complex components, robotic manipulation of the shearography camera has proven to be the optimal solution. An industry 6-axis robot gives utmost flexibility to position the camera in any angle and distance. Automatic defect marking systems have also been introduced to indicate the exact position of the defect directly on the inspected component. Other applications are shearography inspection systems for abradable seals in jet engines and portable shearography inspection systems for maintenance and repair inspection in the field. In this paper, recent installations of automatic inspection systems in aerospace industries are presented. 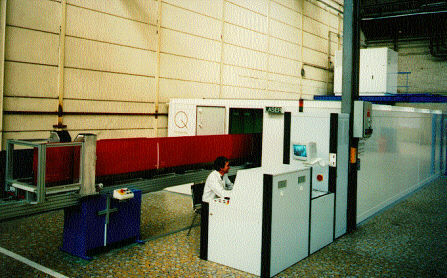 Following a several years phase of evaluation of the technique to show the principal applicability and prove the required sensitivity, now several production lines for aerospace components have been equipped with automatic shearography inspection systems. Shearography, although very similar to ESPI, is typically used for nondestructive testing rather than for material analysis and strain measurement. The shearography method is less susceptible to environmental noise and typically requires less of a technical understanding in order to operate the equipment. It is typically used qualitatively, because additional information and processing is required to determine the absolute value of the deformation. The consequent development to realize small and well working sensors facilitate nowadays an easy made application in complex systems. In this way it becomes possible to achieve an economic integration in automatic production inspection systems. Each rotor blade is manufactured as composite, with foam or honeycomb materials as core of the blade, covered on the outside with one or more layers of fiber reinforced plastics. As reinforcement carbon fibers, kevlar fibers or glass fibers are used. In special, highly loaded areas, as, e.g. at the front edge of the blade, metallic layers serve as additional reinforcement. Consequently, the production of these rotor blades follows a rather complicated and complex procedure. Therefore a 100 % inspection of the blades is required after production. After repairing of defective rotor blades, an inspection of the repaired area is also required. Fig 1: Helicopter rotorblade inspection system. Fig 2: View inside the vacuum chamber withrotorblade in testing position. The rotorblades are mounted in a 10 m long vacuum chamber, fig. 1 and loaded with a relative pressure difference of up to 50 mbar .At this load, debondings and structural defects show up as tiny deformations of the surface of the rotor blades with amplitudes in the range of few micrometers. Two miniaturized shearing cameras, fig. 2 are positioned on a separate guiding system on each side of the rotor blade and observe both sides of the rotor blade. 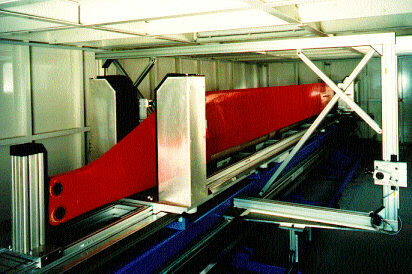 This allows the simultaneous inspection of both sides of the rotor blade during one loading cycle. The inspection areas are illuminated by a 5 Watt Nd:YAG laser, coupled into two fiber coupling systems. The laser beam expanders are positioned together with the shearography cameras on the guide and provide a homogeneous illumination on the whole measurement field. This allows an inspection of areas up to of 600 x 800 mm2 on each side of the rotor blade. After each loading and measurement cycle, the shearography cameras are moved on the linear guide to the next measuring area. Up to 15 measurement steps are required for complete inspection of the largest rotorblades. 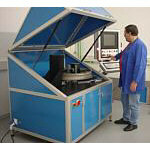 Fig 6: Automatic shearography system for abradable seals inspection. 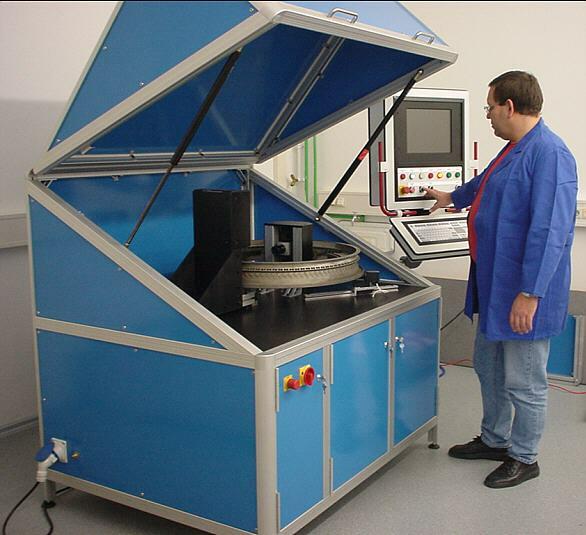 Fig 7: Portable shearography system for field inspection of composite materials.